Custom glass tumblers are classic and beautiful. They come in a wide range of styles, and often use silicone protectors to add a pop of color. Deborah loved that this bottle takes that one step further, carrying the color of the silicone sleeve through to the straw hole and the lid’s gasket. And speaking of straws—there’s a stopper on this one. It may not seem like a big deal, but the stopper keeps the Tritan (read: durable!) straw from falling out of the tumbler accidentally! Deborah loved carrying this tumbler around town and received a number of compliments! However, there are a few things about it that she didn’t love. First, it’s a single-wall glass tumbler, which means it’s suitable for cold beverages only. Naturally, this also means that there’s no insulating properties and that there could be some condensation in warmer weather. The silicone sleeve does a great job keeping that contained, though! The other bummer is that the Glass Tumbler with Bamboo Lid is not spill proof. This is to be expected—it’s a tumbler. However, if you knock it over, just note that there could be some spillage, despite the silicone gaskets around the lid and straw. 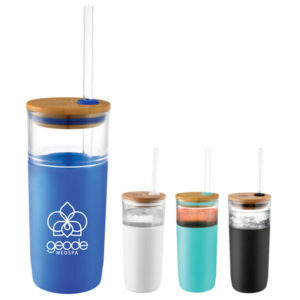 Whether you’re shopping for your staff, own a day spa, or manage a retail store, the bright colors and bamboo lid make this a unique tumbler. The silicone sleeve feels great in your hand, and the glass vessel provides pure drinking. Now, what’s not to love about that?